We’ve been friends for so long that when we got married, it was actually pretty weird. Before the weirdness of the situation could fully hit us, Tanmoy came to Canada. It was only when I finally joined him 3 months later that the reality started to sink in slowly. We weren’t ‘just friends’ any more. Nor were we ‘girlfriend and boyfriend’. We were now husband and wife, meant to live together always. Those first few weeks were strange – the feeling that this fun couldn’t last, that either his parents or mine were going discover us and be horrified to find us living together and order us back to our respective homes (much chastised) wouldn’t go away. That it never happened still seems somewhat strange to me, but we slowly got used to the idea that my parents now actually wanted me to ‘live with a boy’ (hawwww) and his weren’t checking on him to see if he was with me! The last couple of years have been special like none that preceded them. We celebrated this milestone by going away for an idyllic long weekend on a mini-vacation of the kind we’ve both always dreamed of – no plans, no hurrying anywhere. We wanted to just lounge around in a beautiful place and do nothing. We’d go where our fancy took us, with no schedules to follow. And we did. We found the perfect place to stay – a very unique bed and breakfast with very welcoming hosts – The Brick Church. We spent the next couple of days strolling along lake Scugog’s shores, picnicking under lush maple trees listening to the flowing water and rustling leaves and occasionally ducking into boutique stores to window shop. 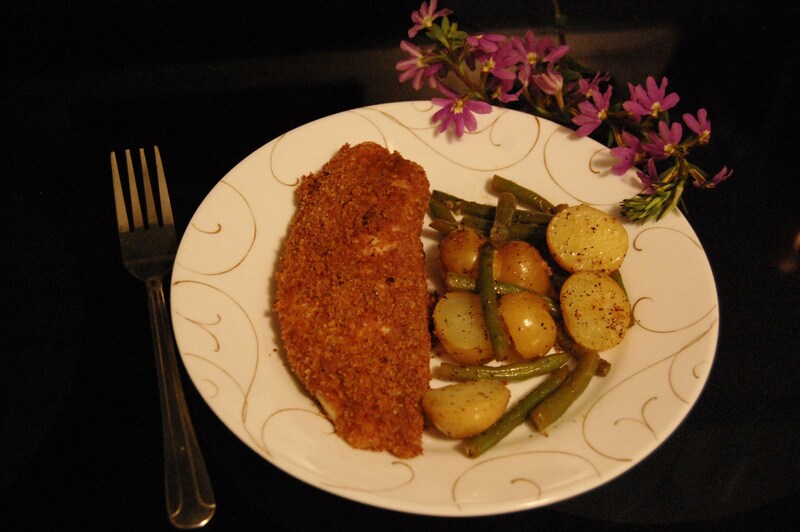 And then, back at the Brick Church, our hostess Jenny dished out the perfect gourmet breakfast for us each morning and one of the nights, she served us this utterly delicious pecan crusted tilapia with roasted potatoes and green beans on a beautifully set table. It was a dinner to remember, and I’ve made it a couple of times since, each time reliving our perfect holiday. Wash and pat dry the fish filets. Preheat oven to 375° C. Line a baking tray with parchment or foil. In a small bowl, whisk together the mayonnaise, yogurt, lemon juice, salt and pepper. In a mixie, pulse the toasted pecans till they form a grainy crumble. Avoid grinding too much, we do not want a powder. In a deep dish, mix together the crumbled pecans, bread crumbs and red chilli powder. Using a pastry brush, coat both sides of the fish with the lemon-mayo mixture. Then place it in the dry nut mixture, making sure the crumble coats the fish on both sides. Place on the lined baking tray. Repeat for each piece of fish. Bake for 15-20 mins at the center of the oven, turning the fish halfway into the baking. Fish is done when a knife tip inserted into a thick part of the fish comes out warm or when fish flakes easily with a fork. Serve with side of your choice – beans and potatoes or rice. Any nuts can be used instead of pecans – almonds, walnuts, hazelnuts. I’ve tried almonds and it was wonderful. Any white fish can be used in this recipe – cod, tilapia or any thing else that you prefer. The baking time might vary slightly based on which fish you choose, but everything else is the same. I ended up grinding the pecans too much, so the texture of the fish wasn’t exactly how it should be. Be sure to just pulse when grinding.